My cousin tagged me in a post on FB this morning, asking if I'd heard of a bunch of themed runs. Are you kidding? Of course I have! Here are just a few that I'd love to add to my list. Themed runs are great if you want a fun atmosphere with no pressure for time. In fact, a lot of themed runs, like the Color Run, aren't timed at all. 1. 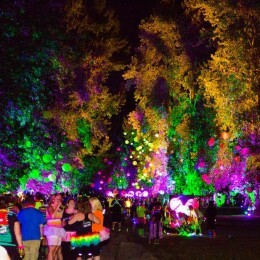 Electric Run - as seen on The Bachelor this week! (Side note - I absolutely LOVE that Juan Pablo took a date on a 5k run.) Neon and a night time run with DJs. Yes, please! 2. The Color Run - while I'm not crazy about the thought of the color powder ending up in my eyes, nose and mouth, the end result just looks like a blast. My girl really wants to do this one so I'm probably registering for the one here as soon as it opens. 3. Warrior Dash - I loved the mud run I did a couple years ago and have been jonesing for another. This one is 3-5 miles long and usually has around a dozen obstacles. A cool medal. A warrior helmet. Plus, beer and turkey legs at the end. Win-Win! Have you done any of these runs? What's been your favorite themed run?